"BY MOST PEOPLE'S STANDARDS, TUKDOG TOOK ME DOWN EVERY WRONG PATH I COULD TAKE. BUT SHE KNEW WHERE SHE WAS GOING, AND I ENDED UP RIGHT WHERE I WANTED TO BE!" My Name is Chase Tingle. I blame everything I have done with my life since 2004 on one sole factor. My first husky pup named Tuk. I acquired her from the middle of ﻿nowhere Northern Maine as a pet dog. I realized pretty quick this was no ordinary dog. This canine had a drive for adventure I had never witnessed before. Don't take me wrong, I myself have always had a drive for adventure, but this dog was something else! I spent the first few years of Tuk's life following (chasing) her to places I never imagined. Into the deepest forests of the North Woods of New Hampshire and Maine. Along the way we had some close calls with moose, bears, and who knows what else! Tuk was nice enough to corral three moose in the high country of New Hampshire in four feet of snow and usher them right towards me. I still thank her for doing that.... Tuk has and always will be a wild one! To the end of her days and beyond the spirit of the great Tuk-Dog will live on in the name of this kennel. Many times friends would ask while we were hiking or camping, "where's Tuk?" With Tuk's amazing ability to slink away unnoticed and disappear for hours or sometimes longer, my reply would often be with a depressed acceptance, "Oh.. Tuk's away... Again...!" Well this theme of Tuk and her ability to seek out adventure is the foundation of this kennel's name. I live by adventure. I thrive on it. Tuk has taught me how to do this in the finest fashion. Trails only have gone where other's have already traveled. To seek the unknown and find pure adventure one must leave the beaten path. That is how I approach Tukaway Sled Dog Kennel. listen to the dogs and they will give you an experience you could never imagine! 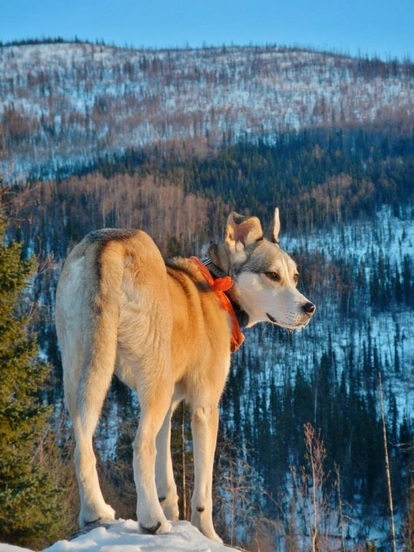 I began running sled dogs in my home state of New Hampshire in 2007. At the time it seemed like a one winter job of guiding tourists through the beautiful New Hampshire mountain country, but it turned out to become a passion. Something about traveling behind a sled of a cohesive team of dogs moving forward with pure silence, yet with the power of a freight train got me hooked. Since that first winter I have traveled to and from Alaska many times. My first experience was in 2007 where I began working in the field performing archaeological survey in the most remote parts of Kodiak, Alaska, where the biggest bears in the world call home. After doing that for a few summers the path of sled dogs took me to Alaska for the first time in 2010. Because of these amazing animals I found myself living on a glacier in Southeast Alaska where I lived with a crew of twenty humans and two hundred and fifty sled dogs guiding tours during the summer months in that rugged country. I made the final move to Alaska in 2013 in pursuit of Alaskan winters and the experience of driving dogs in the purest of sled dog environments. Now I am the proud owner of a kennel of dogs with a drive to go forward! Tuk is still by my side. She spends more time on the warm couch these days than traveling the depths of the woods with her nose to the ground pursuing what only she knows. But Tuk still drives with adventure when we go for hikes and walks but thankfully with age.... My little girl sticks by my side just a little bit better, yet still I keep close watch on my dog and her ability to sneek off! Traveling with the team through Yukon Quest country. 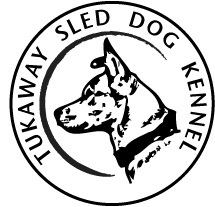 Tukaway Sled Dog Kennel is a mid/long distance racing kennel located in Two Rivers, Alaska. 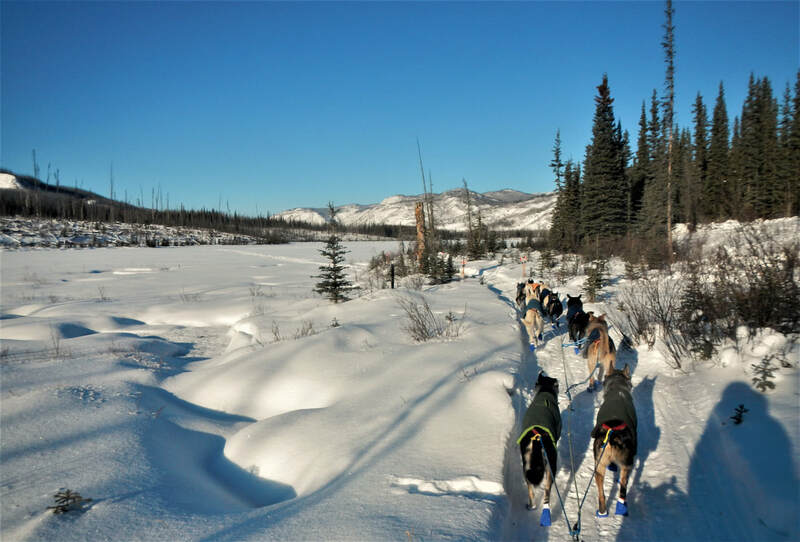 Our goals are some day to run the Yukon Quest and the Iditarod, both of which are Alaska's premier 1000 mile long races. It is not an easy road to get to these races. It takes thousands of miles of training and enduring the harshest of weather along the way. Many sleepless nights and long hours of riding the runners of the sled behind a team of effortlessly trotting huskies awaits. To some it seems like a cold and frigid life. To the team of Tukaway, running long and sleeping less under the darkness of the Alaskan winters illuminated by the dancing aurora borealis invigorates us to drive on! So come and follow us and our journeys over the years as we prepare for the greatest of sled dog events!